Security is the primary requirement when it comes ensuring efficient operation of commercial, industrial and even residential premises. What can provide a safe, secure and dependable source of security across these environments? An automatic gate operator is an answer. This is an Access Control Gate Operator system that is geared to ensure maximum security at your premises’ point of entry. 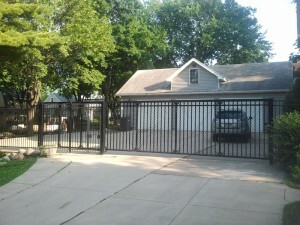 If you’re looking for the best Gate Operator Installation Twin Cities, MN can offer check us out! We are a local fence installation company in Minnesota who specializes in finding the exact security need for your property. We deal with various clients who are in charge of properties that are highly secured with minimal traffic around the property. We provide a lasting automatic gate opener that comes along with professional-grade accessories to supplement its services. Our fencing contractors work with you to identify the unique needs that concern your property’s security needs, in order to provide you with customized solutions. All our solutions are backed up by LINEAR. We work with our contractors to provide gate installation services in Minneapolis & St. Paul to offer Swing Gate Systems, Barrer Gate Systems, and Slide Gate Systems. Our customized security systems are made by a leading manufacturer to make the best security systems. Our team of installers come in to help you through the installation process that depends on your unique security requirements. The system is easy to operate, thanks to the integration mechanism that is installed in almost all your electronic devices. You will be able to monitor your property through your phone, your car and you will be able to track what is happening without much effort. The gate operators we provide allows you to have a 24/7 property security control of your property. If you want to monitor any suspicious activity around your property, use our advanced gate operators to help you have a peace of mind both during the day and at night. Our products which are made by top manufacturers have been made to have simple access controls in the form of a clicker, a card reader or keypad. We also provide brands that have authorization access through the smartphone. If you seek to have “bullet” proof security system that provides comfort to your property, contact us, and we will provide you with a quote that suits your unique needs. We are here to help you sleep at night in peace, provide you with systems that enhance your business operation, thanks to our international standard security systems. Contact us at 763-755-0088 or through our email at infor@arroefenceco.com.